Gulzar said although there was lot of nostalgia, 'it was not right to live in nostalgia' and one has to change with time. Amidst a thunderous applause and a standing ovation from a packed auditorium here, noted poet, lyricist and filmmaker Gulzar was on Saturday conferred the prestigious Dada Saheb Phalke award — Indian cinema’s highest honour — by President Pranab Mukherjee. 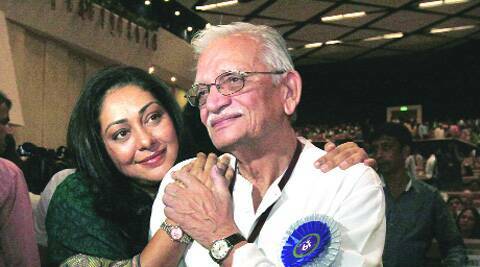 Receiving the award, a visibly overwhelmed Gulzar said it rarely happens that someone whose job is to play with words struggles to find right words to express his gratitude. He said that at different stages of his life, he had received immense support from many people in the film industry and he was grateful to them all. “Koi bhi shakhs aise mukaam pe akele nahin pahunchta,” he said. Gulzar thanked legendary film-maker Bimal Roy and recounted: “Unhone haath pakad ke uthaya aur apne saath le liya.” He expressed gratitude to the likes of Salil Chowdhury, S D Burman and Hemant Kumar. He mentioned R D Burman, Madan Mohan and Illayaraja as some of his contemporaries who influenced his work. In the current lot, he named A R Rahman, Vishal Bhardwaj, Shantanu Moitra and Shankar-Ehsan-Loy as those who had helped him achieve what he has. Gulzar was presented with Swarn Kamal (golden lotus) medallion, a cash prize of Rs 10 lakh and a shawl by the President. He became the 45th recipient of the highest distinction given for contribution in the field of Indian cinema. Gulzar said although there was lot of nostalgia, “it was not right to live in nostalgia” and one has to change with time. On a lighter note, he elaborated upon this point by saying that in today’s times of cellphones and SMSes, him penning a “daakiya daak laya” would make no sense. He also went on to add that the defence forces and the film industry were the only two places where there are no enemies in the name of caste and religion. A total of 41 awards in the non-feature film category and another 40 awards in the feature film category were given by Pranab. Three awards were given to Best Writing on Cinema. The Indian Express’s Senior Assistant Editor Alaka Sahani received the award for Best Film Critic for highlighting the facets of cinema beyond glamour and gossip.